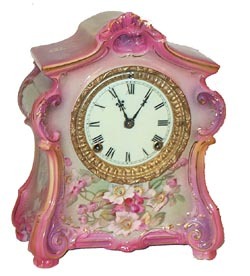 Ansonia Clock Co. porcelain, "La Fontaine", ca 1904. This is another outstanding Royal Bonn case clock from the Miller collection. The New Art Tint colors are primarily pink shades that you just never see in the porcelain clocks, and the designs of snowflakes and flowers painted in gold on the casetop. There are pink flowers on the front and sides and just the right amountof gold accents. It is not one of the larger Royal Bonns at 11-1/2 incheshigh, and 9 inches wide, but the style says, dont sell me. There is an opening, or handle, above the dial, shell like designs on the 4 corners, and 4 sidescurling down to the feet. American sash, beveled glass, one piece porcelaindial, all near perfect. 8 day, gong strike, running. Case and dial properlysigned by Ansonia, and the German case makers that fired the porcelain case.Ly-Ansonia No. 2595.